KENNEDY SPACE CENTER, Fla. — Satellite fleet operator Arabsat of Saudi Arabia on April 28 said it had entered into contracts valued at $650 million with satellite builder Lockheed Martin Space Systems and launch provider Arianespace for the construction of two satellites and the launch of one of them in 2018. Denver, Colorado-based Lockheed said the contracts include a partnership with Taqnia Space Co. a subsidiary of Saudi Technology Investment and Development Co., to “explore future manufacture, assembly and integration of satellites” on Saudi territory. Lockheed and Taqnia will create a limited-liability company that will develop space technology in Saudi Arabia. Arabsat and Lockheed, in separate statements, said the contracts are with not only the satellite fleet operator, but also with King Abdulaziz City for Science and Technology, KACST, which will spearhead Saudi efforts to stimulate a domestic space industry. One of the satellites, Arabsat 6A, will add to Arabsat’s existing fleet and operate from 30.5 degrees east. Arabsat said April 29 that it will sign a contract with SpaceX for the launch. The press release did not specify which SpaceX rocket would be used for the Arabsat 6A launch. One industry official said Hawthorne, California-based SpaceX had bid its Falcon Heavy rocket, scheduled for an inaugural flight late this year, for the Hellas-Sat launch, and that International Launch Services of Reston, Virginia, had bid Russia’s Proton rocket. 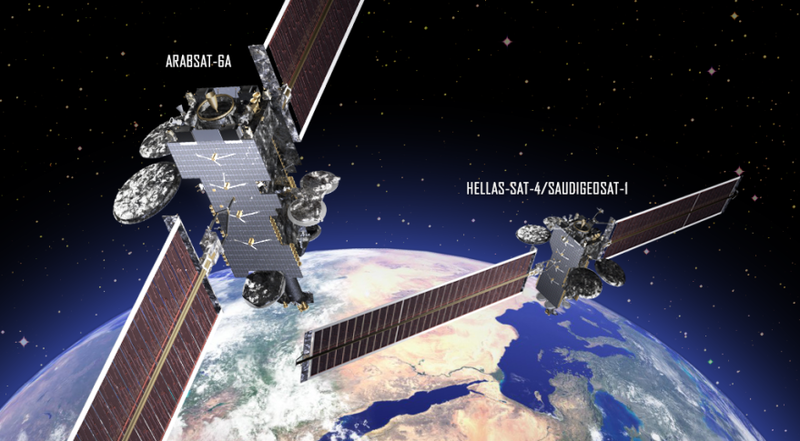 The other satellite, Hellas-Sat-4/SaudiGeoSat-1, will be used by Hellas-Sat of Greece, which Arabsat owns, at 39 degrees east. It will be launched by Evry, France-based Arianespace aboard an Ariane 5 rocket. Arianespace said it is expected to weigh 6,000 kilograms at launch. The contracts end a long dry spell for Lockheed, whose officials have said repeatedly that they would reduce the cost and delivery time of the company’s A2100 satellite frame to return to a competitive position in the commercial satellite market.